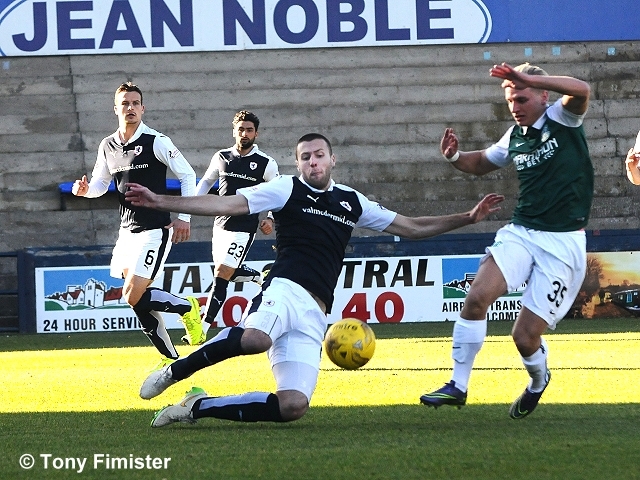 A rousing and spirited second-half performance wasn’t enough to sustain Raith Rovers 100% home-record this afternoon, as they went down 2-1 to a Hibernian side, who moved to within five points of leaders Rangers with the win. 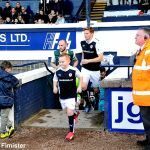 Ray McKinnon made one change from last week’s win over Alloa Athletic, with Craig Wighton dropping to the bench for Ross Matthews, who supplemented the midfield, with Mark Stewart asked to play just behind Jon Daly in front of a narrow midfield four. 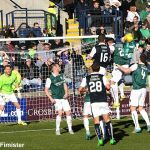 Hibernian started the match shooting towards the Raith stand, and it was the away side who created the game’s opening chance, when Liam Henderson’s free-kick was flighted towards an unmarked Darren McGregor at the back-post, but his header could only ripple the side-netting. However, Rovers relief was short-lived, as Alan Stubbs’ side took the lead with an excellent strike after just four minutes. 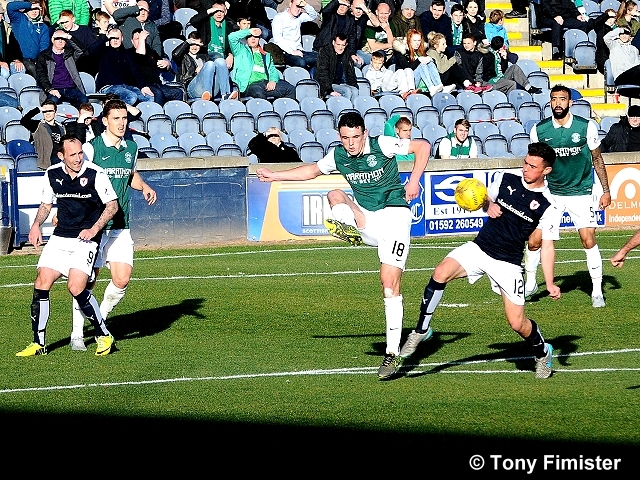 The initial Hibs attack appeared to have been halted at the edge of the area, however, John McGinn gathered up the loose ball 20-yards from goal, and after taking one touch to set himself, he unleashed a fantastic strike past a helpless Kevin Cuthbert, to put Rovers behind at Stark’s Park for the first time this season. 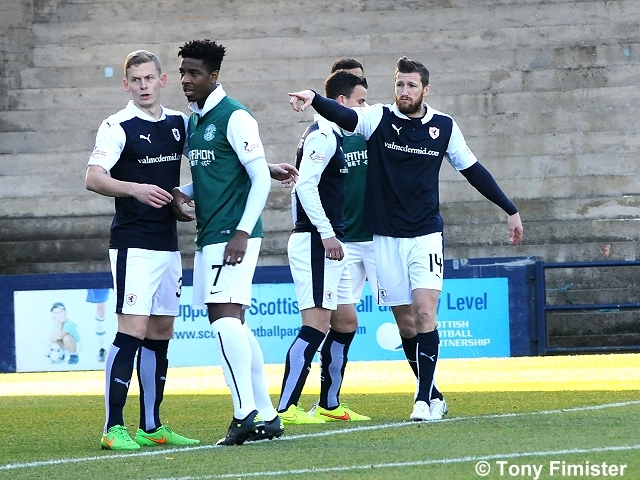 The early goal was a huge setback to Ray McKinnon’s side, who had made a fairly timid start to the game. 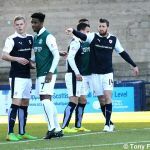 A Raith Rovers free-kick in the middle of the park was squared straight off the pitch, and from the resulting throw-in, Hibs broke away, allowing McGinn another bash at goal, but this time he pulled his effort wide. 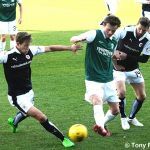 Hibs were very much in the ascendency at this stage, and while Rovers were seeing a fair amount of possession, they were toiling to create anything of note. 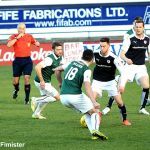 To compound matters, there was a slickness about Hibs in terms of turning defence into attack quickly, with Jason Cummings and Dominique Malonga looking in the mood up-front. 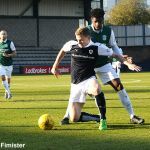 It was the latter of the two who had a chance to increase Hibs lead after quarter-of-an-hour, but after good work from Dylan McGeough, his low cross found Malonga inside the six-yard-area, but the striker found himself crowded out before he had a chance to get a shot away. 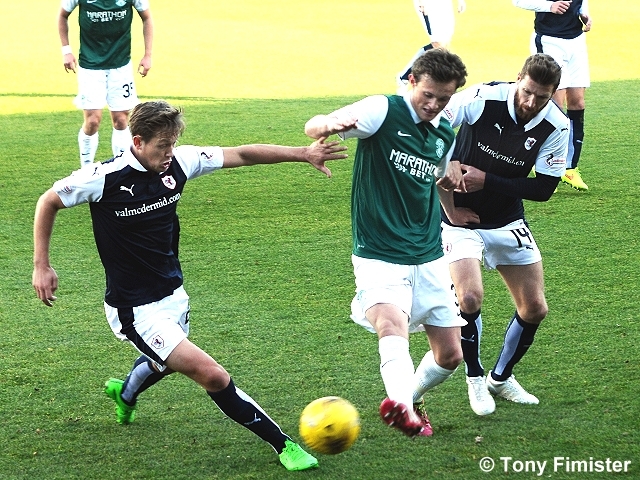 Rovers had yet to really trouble the Hibs backline, other than a couple of brief flurrys. Iain Davidson released Scott Robertson on the left, and whilst his cross caused a bit of a fankle inside the away box, it was eventually cleared to safety. Mark Stewart was then played down the left, but his cross-shot across the area bobbled ineffectively wide. It was a slight hint for the home fans that their side had the ability to get back into the match. 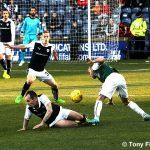 However, they were somewhat dashed after 25 minutes, when Hibernian doubled their advantage, with another excellent finish. Lewis Toshney appeared to be caught underneath a mighty thump up-field from goalkeeper, Mark Oxley, which Cummings brought down expertly, before dinking a fine lob over the onrushing Kevin Cuthbert for 2-0. Rovers now had the metaphorical mountain to scale, although the remainder of the half was mostly concerned with keeping the deficit to two. 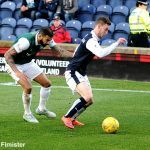 David Gray tried his luck from distance after a Malonga header wasn’t cleared effectively, while McGinn was also keen to shoot from anywhere within 25-yards, although once again, he failed to test Cuthbert. 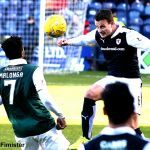 Liam Henderson then almost took advantage of a James Craigen pass-back, which arguably travelled higher into the air than it did towards Cuthbert, although the midfielder was eventually shut out by Kyle Benedictus. 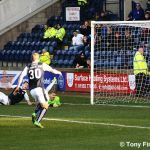 As disappointing as the first-period had been from a Raith perspective, the one positive was that the damage wasn’t quite irreparable. That said, the second-half began with Hibs looking to seal the match, and Henderson almost done just that, after cutting in from the left and curling a fine effort just past the far post. 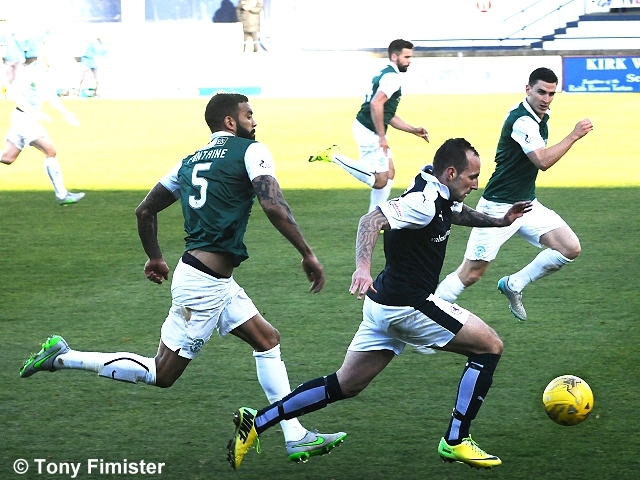 Oxley had yet to tested in the Hibernian net, but Rovers did fashion their first chance after 50 minutes. 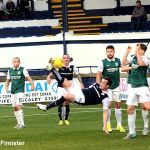 A free-kick from the right found Scott Robertson at the edge of the area, and while his first-touch appeared to make life more difficult for himself as it spun into the air, his acrobatic shot wasn’t too far wide. 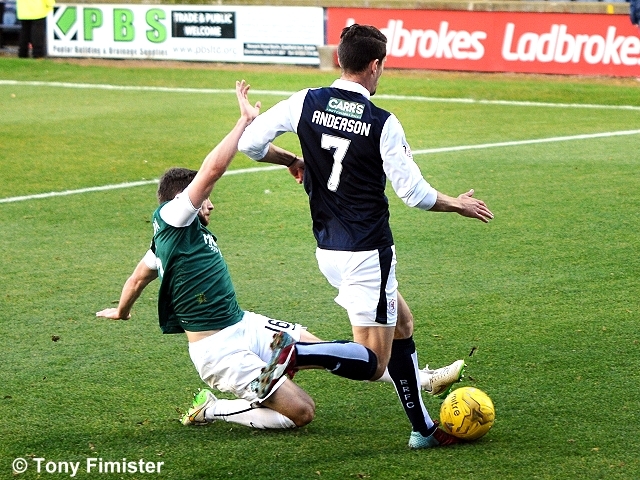 Like last week, Ray McKinnon decided to make a double substitution, and just a minute after Robertson’s chance, Craig Wighton and Mitch Megginson replaced James Craigen and Ross Matthews. Just like the aforementioned fixture, the substitutions seemed to create a positive impact on the team, and while the goal didn’t arrive quite as promptly as last Saturday, Rovers found themselves back in the match with half-an-hour remaining. 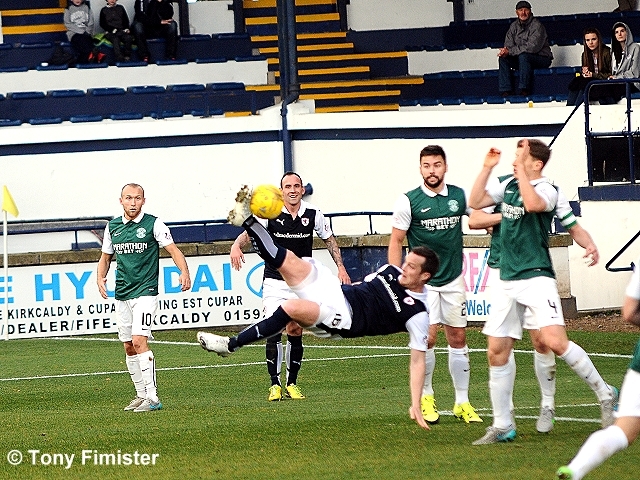 Jason Thomson whipped an excellent ball from the right to the back post, to find Jon Daly peeling away from his marker before forcing a header past Oxley from close-range. 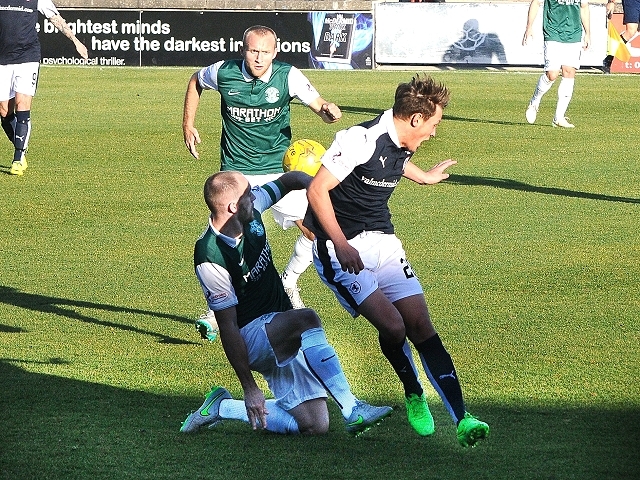 Rovers now very much had their tails up, and Wighton was afforded too much room inside the area a few minutes later, but a strong block from Lewis Stevenson prevented the youngster from getting a shot away. Disconcertingly however, Wighton was forced off on a stretcher in the aftermath of the tackle, to be replaced by Grant Anderson with 25 minutes remaining. 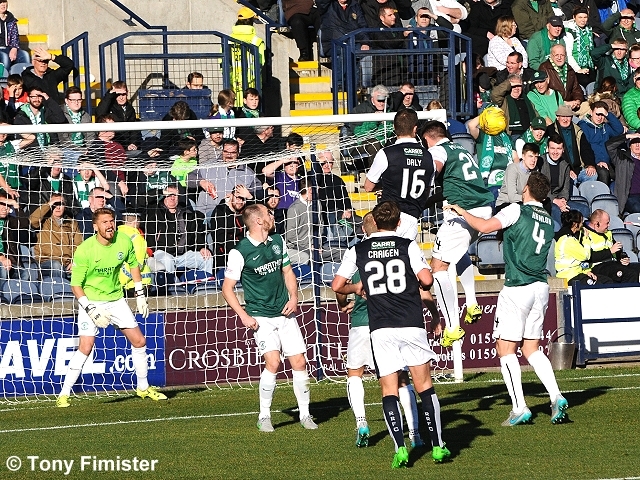 The lengthy break for treatment gave Hibs a few minutes of respite, but Rovers were straight on the attack again, with Rory McKeown’s long throw finding Davidson who saw his shot blocked, before Stewart darted into the penalty area, only to send his shot over the bar. 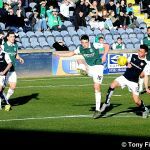 Rovers were still enjoying the lion’s share of the ball, but three Hibs substitutions inside eight minutes had somewhat broken up their momentum, while the pace of James Keatings who had just been introduced, gave the away team a new, troublesome outlet. 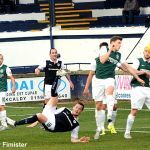 Rovers continued to press, and in the 83rd minute, the players and fans felt hard-done by, when Daly’s overhead kick from a Stewart header, was blocked on the line. 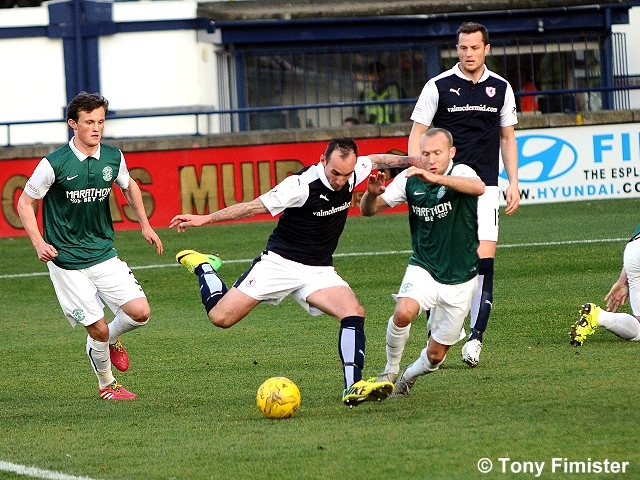 There was a huge appeal for a penalty, although referee George Salmond was adamant the incident didn’t merit one. Grant Anderson then went down under a challenge inside the area as the fans roared for a foul, but again nothing was given. 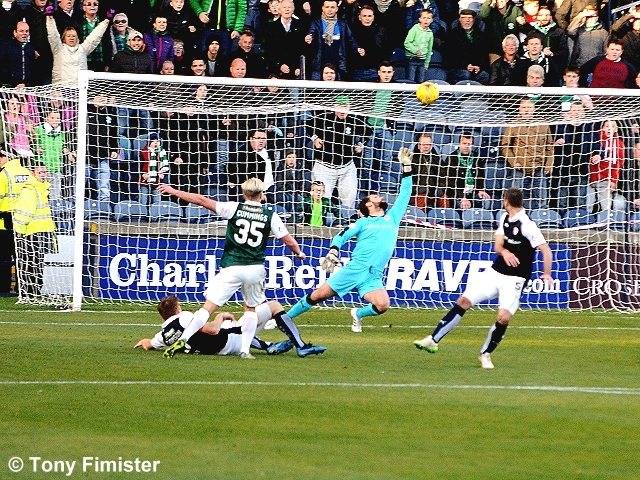 Even as the match continued deep into stoppage time, Rovers continued to create chances. Benedictus saw his 22-yard free-kick well held by Oxley, then right on full-time, Thomson managed to fire a shot on target from inside the area, but his goal-bound effort was headed over the bar. 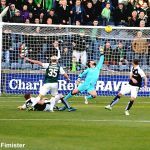 While the final whistle brought disappointment and frustration, Rovers could take heart from the fact they had Hibs on the back-foot for large spells of the match. 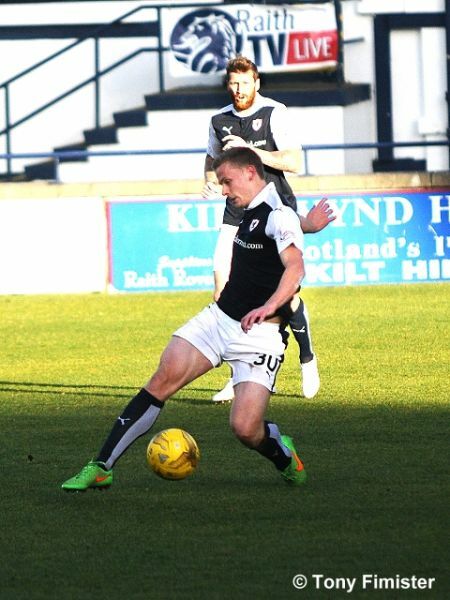 They’ll be hoping to take the excellent second-half performance into next week’s match against Livingston. 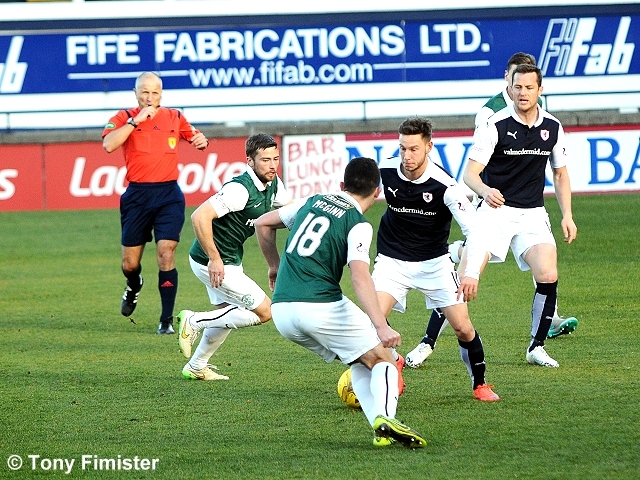 Raith can leapfrog Hibs into second with a win today. 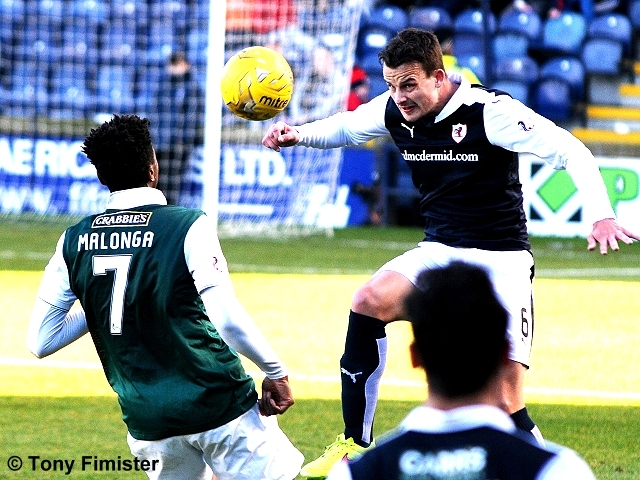 Come on You Raith! Thomson's floated ball in found Daly who nodded home. COME ON!! 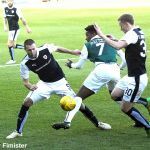 Hibernian:Oxley, McGregor, Hanlon, Fontaine, Gray, McGinn, McGeouch, Henderson, Stevenson, Malonga, Cummings. 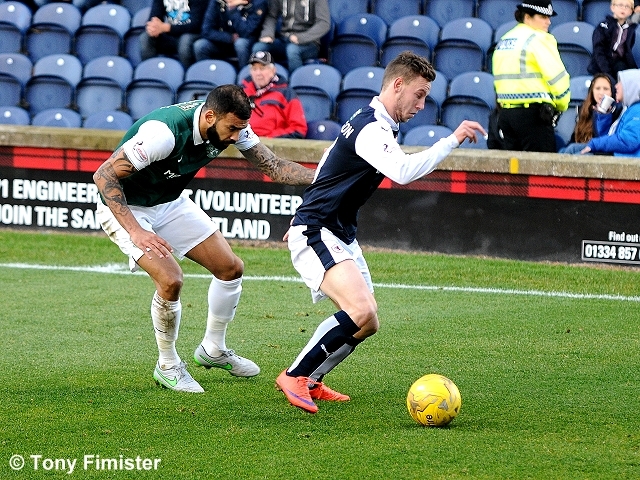 Subs:Reguero, Bartley, Fyvie, Boyle, Keatings, Feruz, Forster. 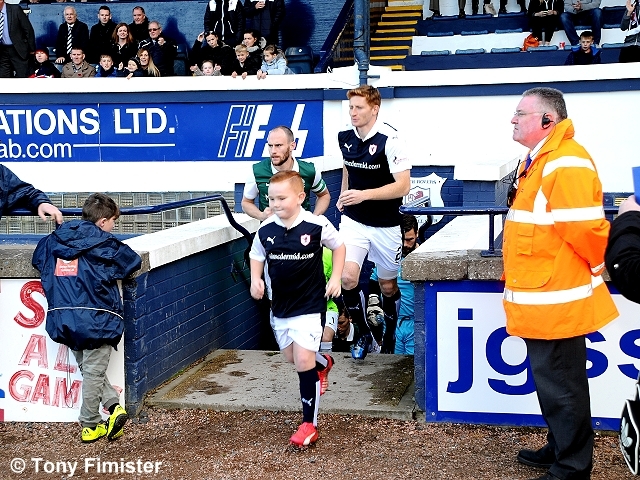 Stark’s Park plays host to the biggest match in the Championship this Saturday, as third place Raith Rovers tackle second-top Hibernian. 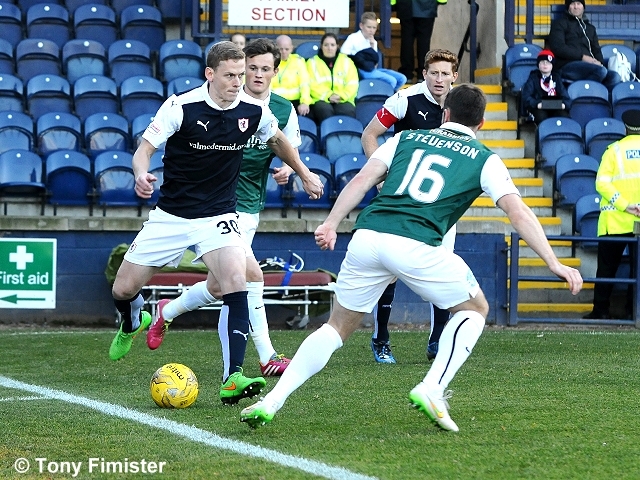 Allan Stubs’ side leapfrogged Rovers after a 1-0 midweek win over Falkirk, sealed by a first-half penalty, scored by Jason Cummings. 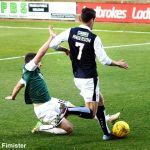 It was a result which sustained Hibs fantastic run of form, a sequence of results which sees them unbeaten in their last nine games in all competitions, with their last defeat a 1-0 loss to Rangers, back in August. 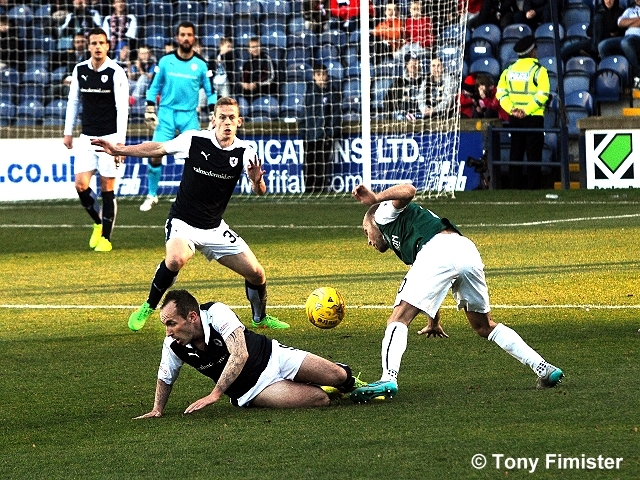 However, Ray McKinnon’s men are in fine fettle themselves, with last week’s victory at the Indodrill Stadium, their fifth league win in succession. 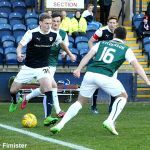 They also boast a 100% home record, conceding just one goal in the process, the fewest in all four divisions in Scotland. 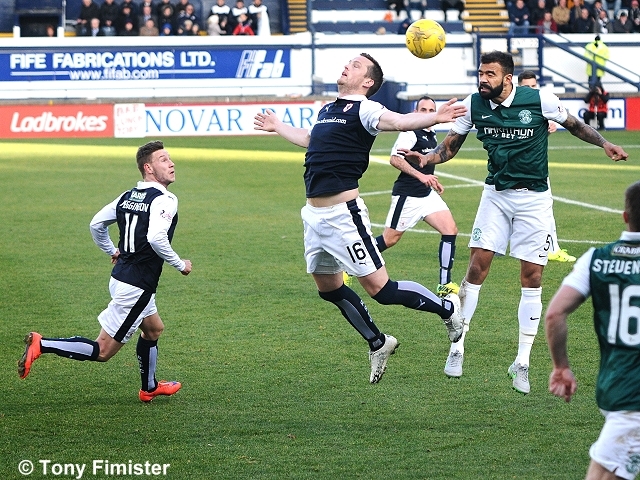 The earlier meeting between the two teams this season saw Raith lose by two goals to nil at the tail end of August, after goals from James Keatings and Jason Cummings. 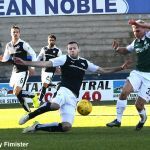 It sustained James Keatings excellent scoring record against the Kirkcaldy side, with the Hibs forward now amassing eight goals against Raith in just two and a quarter seasons, for Hamilton, Hearts and now Hibs. 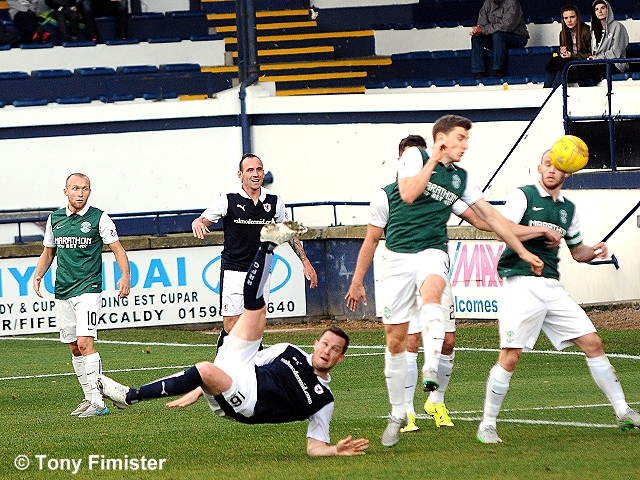 Hibs only win against Rovers last season came at Stark’s Park, with a 3-1 win in December. Barrie McKay put the home side ahead five minutes before half-time, but the two sides still went in level, as Jason Cummings equalised a few moments later. 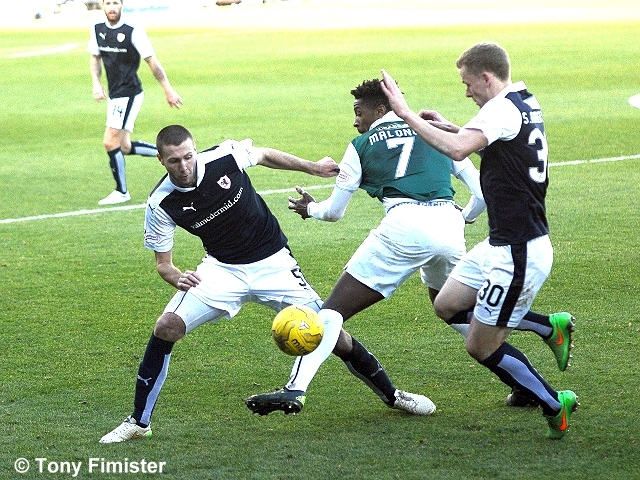 Liam Fontaine and Dominique Malonga sealed the win in the second period. 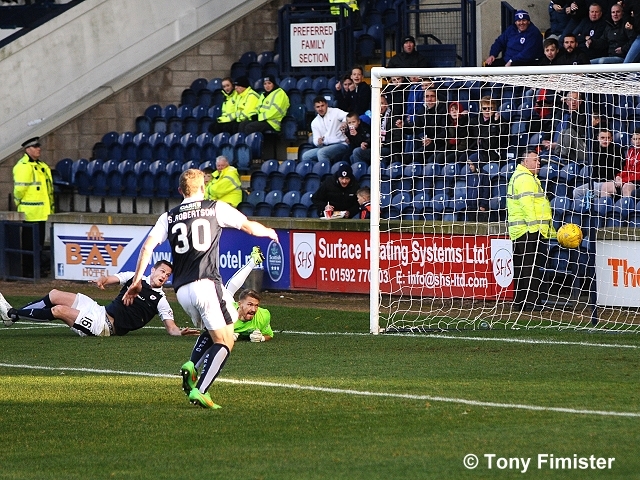 However, Rovers turned the tables in the second meeting at Stark’s Park, after an excellent 2-1 victory in March. 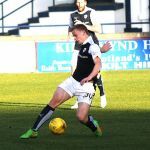 Mark Stewart put Rovers into the lead early in the second-half, but once again, the lead only lasted a few minutes, with Fraser Fyvie restoring parity almost immediately. 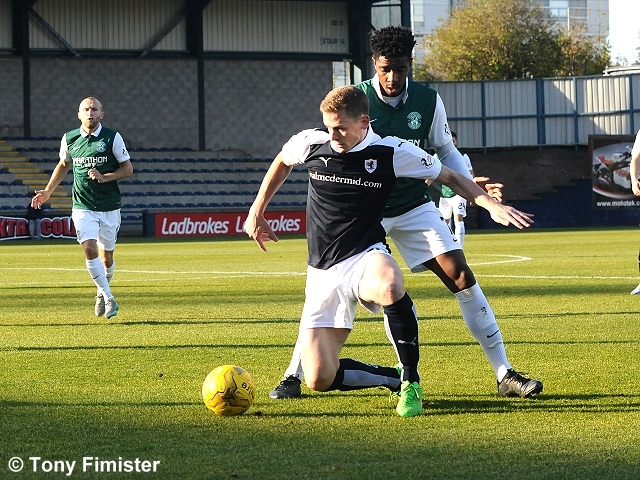 However, Raith wouldn’t be denied, after good work by Christian Nade, who supplied the cross for Lewis Vaughan to grab the late winner. 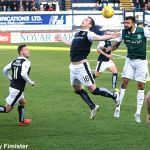 Rovers had a fine record against Hibernian last season, but the most recent head-to-head record would suggest that’s the exception rather than the norm. 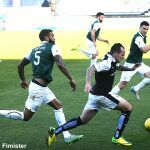 In the last ten league fixtures between the two clubs, Rovers have just one win and three draws compared to Hibernian’s six victories.